Rachel was in her mid-thirties when she died suddenly and unexpectedly, leaving behind a grieving husband and their young daughter. It has been a year since Rachel's death and since then, she has been looking down on her family, watching as husband Max and their daughter, Ellie cope without her. 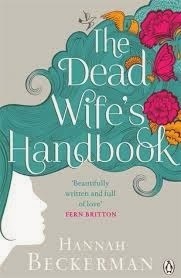 I'd been looking forward to reading The Dead Wife's Handbook as I thought it had an interesting concept and I've heard some wonderful things about it - and now I can see why. I thought the book was such an interesting and compelling read, not to mention an emotional journey as both Rachel and her family come to terms with her death. My heart went out to Rachel as she looks on as her family struggle with their grief, unable to comfort them and I could feel her frustration and helplessness, but it was Ellie I felt for most. Ellie is only young and is sometimes confused about the loss of her mother and what lies ahead for her. She was probably my favourite character from the book as I thought was she was a lovely little girl who was battling such horrific grief, often with a maturity beyond her years. Like Rachel, I wanted to scoop her up and give her a big cuddle. As well as Max and Ellie, Rachel's death also impacts on her mum, Celia and best friend Harriet's lives, and we see how the different people from Rachel's life react when she is gone. I really felt for Celia, who had leant on Rachel quite a lot over the years. She still has Ellie, but she doesn't see her as often as she would like and I could understand her developing fears as the book moves along. The book could have been quite depressing as Rachel watches her loved ones continuing without her, but while there are some moving, poignant moments, there are plenty of lovely and uplifting ones too, which made it a great read.